The famous Grand Prismatic, the largest hot spring in Yellowstone National Park, Wyoming. 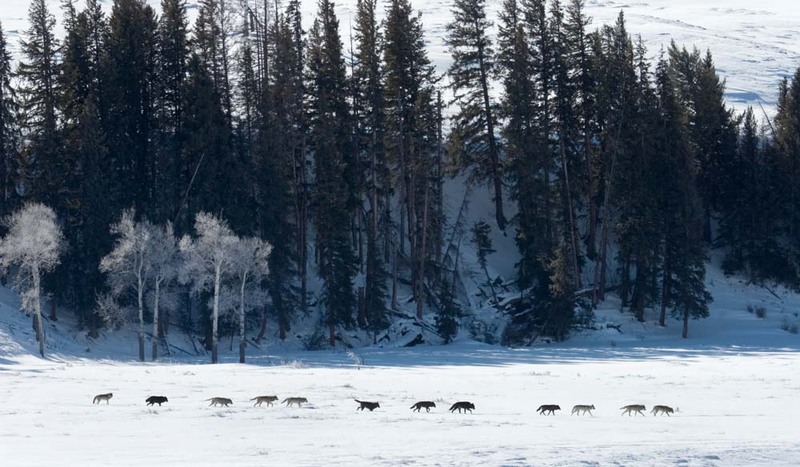 Large line Druid wolf pack Lamar Valley, Yellowstone, Wyoming. America’s most famous wilderness, Yellowstone National Park, is one of the world’s most remarkable protected places. Why? 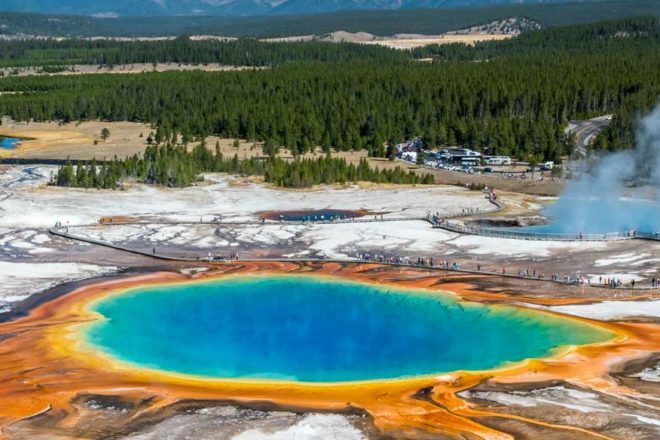 This list of Yellowstone attractions put the ‘high’ in highlight, writes Daniel Down. The USA’s National Park Service embarks on a new century of protecting the country’s wilderness areas this year. 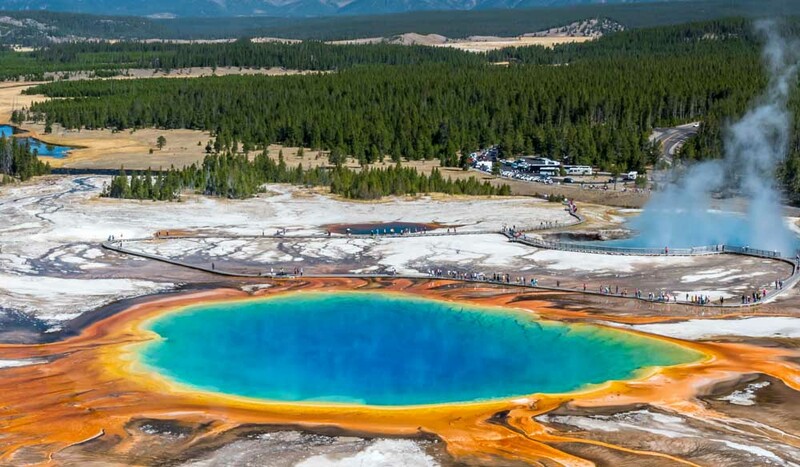 Within its charge is Yellowstone, the world’s oldest national park founded in 1872, in Wyoming, Montana and Idaho. This sprawling landscape of fire and ice, forests, mountains and lakes, with a thriving ecosystem of some of the world’s largest mammals, makes it a park you have to see at least once in your life. And more than 4.25 million people did so last year, a record for Yellowstone. Don’t worry, at 8991 square kilometres it’s a big place. They came to see its many wonders, from show-stopping geysers (approximately half of the world’s total are here) and colourful volcanic springs, to the soaring peaks of the Grand Tetons to the south with countless bison grazing the grasslands below. It’s a picture of much of the continent as it once was, home to Native Americans for more than 11,000 years before it became the rugged frontier of the New World. Yellowstone’s grand age makes it the old man of national parks, a fitting start to our series exploring the most wondrous natural spaces on the planet. Drive along this broad valley and keep your zoom lens close as you spot herds of bison and elk grazing on the lush grasslands. If you’re lucky you’ll see a roaming grizzly or a pack of wolves; it’s a good opportunity to see a thriving ecosystem of large mammals – something you’d normally need to embark on an African safari to witness. The reason most people head to Yellowstone is surely to witness this famous natural showpiece, a geyser that erupts with (almost) boiling water around 20 times a day. In the 19th century people would throw their linen and cotton clothes into its roiling pool to be cleaned by being blasted up to 56 metres into the air. Yellowstone sits on a subterranean super volcano (which could go off at any time, destroying a large portion of the US!) that drives all its spectacular geothermal activity. Eruptions over the millennia have created its remarkable forest of fossilised (petrified) trees. Having been encased in volcanic material from eruptions thousands of years ago, the trees eventually became rock themselves and remain standing after the softer rock surrounding them wore away. At 110 metres across, the largest hot spring in the US is also one of the most photogenic lakes in the world. Its beauty owes to the fact that its colours match the rainbow that you get when you split light through a prism (hence the name). Going from a brilliant red/orange through to yellow, green and deepening shades of blue, the colours are a result of various layers of microbes that exist in its boiling waters. Take these Yellowstone trails to reach new peaks and perspectives. Hike to the summit of Bunsen Peak – a 6.9-kilometre round trip – and you’ll be able to see all the way from the western Gallatin Range out across the plateau that comprises much of the park, to the Beartooth Mountains. Walk up into the forests surrounding the main geyser site to get a different perspective of Old Faithful firing its plume. Head up in the early morning to have these views to yourself on this 2.8- or 3.7-kilometre walk. Take this 11.2-kilometre trail to find yourself in rolling prairie country with ample opportunity to spot bison, elk and wolves; the Lamar Valley is referred to as the American Serengeti for good reason. Lodging and camping inside Yellowstone National Park fills up fast. It’s recommended that for summer trips you book six months to a year in advance; for autumn/spring trips, three to six months. Visit National Parks Service – Yellowstone for more information.